Since it appears more likely than ever that we’ll go over the fiscal cliff, we might as well start cataloguing this historic achievement. First, it will be the largest tax increase since World War II, at about 3.5 percent of GDP. Second, the fiscal cliff is a historic income tax cliff. 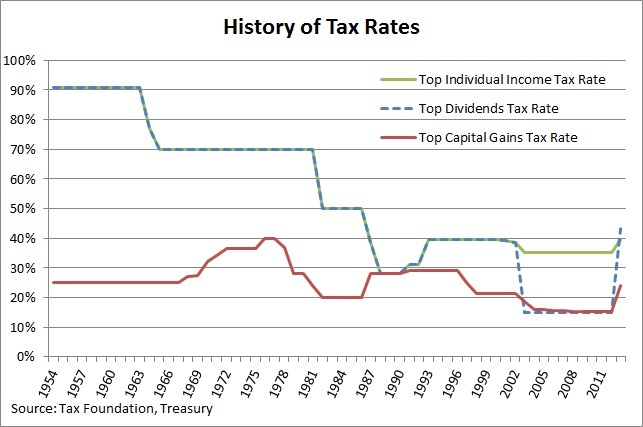 As the chart below shows, it will result in the highest tax rate on individual income (39.6 percent) since 2000, the highest tax rate on capital gains (23.8 percent) since 1997, and the highest tax rate on dividends (43.4 percent) since 1986. Lastly, the fiscal cliff will be the first major tax increase since World War II to occur under a Republican controlled House of Representatives. The only lesson that can be drawn from that is don't do temporary tax cuts, e.g. the Bush tax cuts, unless you want them to be temporary. Update: Steve Entin reminds me that the 1990 income tax increase was probably a contributing factor in that year's recession, as was that year's payroll tax increase, and the economy was already weakened by the 1986 tax increase on capital and the 1988 payroll tax increase.